One of the ways to stay on top of your game when it comes to marketing luxury real estate is watching HGTV when they feature extraordinary homes and million dollar rooms. It will help you expand your “vocabulary” in the Language of Luxury. For example, in a recent episode of Extreme Homes, an absolutely stunning custom designed, multilevel home was featured that was built on a cliff overlooking the Southern California coastline. The homeowners are truly passionate not only about fine architectural design but also automotive design. 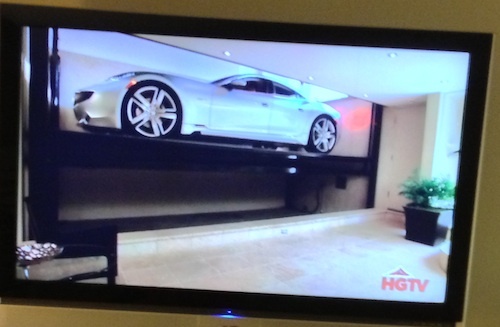 In fact, when they drive one of their cars into the garage (on the upper level) the floor of the garage can descend into the lower level of the home where the car can be showcased like a work of art. (See the photos above). Understanding what your clients are passionate about can help you find them the home of their dreams. It can also give you a competitive edge in a listing presentation when you can connect with homeowners on their level. The more you are familiar with the many facets of the luxury realm the more you will have in common with your ideal clients. The faster you can build rapport the faster you can build trust. This also translates into the acceleration of referrals. And, that is a great way to stay on top of your game.